The story of Jason and the Argonauts is amongst the most famous tales from Greek mythology, and even the modern day it is the myth most often retold. The story of Jason and the Argonauts of course deals with the quest of Jason to bring back the Golden Fleece from Colchis to Iolcus; and in order to achieve this, Jason had to surround himself with a band of heroes. The gathering of heroes was a core element of many famous Greek myths, and after all it was the premise for the stories about the Trojan War; the quest of the Argonauts took place a generation before the events at Troy. To travel to Colchis would require the construction of a ship unlike any previous built, and this task was allotted to a master craftsman called Argus, who possibly originated from the city of Argos. Argus would be guided in the construction of this new ship by the goddess Athena. Once built, the ship would be called Argo in recognition of the man who had constructed it, and subsequently the heroes who sailed on-board it were known as the Argonauts, the Argo Sailors. Building a ship was all very well but the Argo would require 50 powerful oarsmen to power it to Colchis. The news of the quest that Pelias had given to Jason had spread across the ancient world, and soon all the most heroic men of the time were making their way to Pagasae Harbour at Iolcus. As with all such gatherings in Greek mythology there is no definitive list of just which Greek heroes made up the crew of the Argo. Most often, a list of Argonauts is taken from the Argonautica by Apollonius Rhodius written in the 3rd century BC; but even by this time the story of the Argonauts was old, because the adventure had been referred to a hundred years before in Medea by Euripides. In the Argonautica by Apollonius Rhodius 55 names for the Argonauts can be ascertained, which is perhaps in keeping with the expected 50 oarsmen for the Argo. The Argonautica is not the only ancient source to tell of the Argonauts though, and other names, some the same and some different can be found in these sources. The Bibliotheca (Pseudo-Apollodorus) lists 44 names, Fabulae (Hyginus) gives 63, the Argonautica by Gaius Valerius Flaccus, tells of 51 heroes, and the Argonautica Orphica, gives the names of 50 Argonauts. In total, from the five sources 85 different names are ascertained. Jason – Jason was the son of Aeson and Alcimede, and the hero quested by Pelias to bring back the Golden Fleece so that he might succeed Pelias as the king of Iolcus. As the man given the task, Jason was eventually elected captain of the Argo and leader of the expedition to Colchis. Heracles - Heracles was the greatest of all Greek heroes, and was the son of Zeus and Alcmene. Heracles already had a significant reputation when the heroes gathered to board the Argo. Heracles would turn the chance to lead the group of heroes, and as Heracles was destined not to reach Colchis, it was a wise choice. Heracles would be left upon Mysia when the Argo stopped there, and of course Heracles would subsequently go on to complete his own Twelve Labours. Castor and Polydeuces (Pollux) – Castor and Pollux were sons of Leda born to different fathers, Tyndareus and Zeus, meaning Castor was mortal and Pollox was immortal. The Discouri were skilled warriors and were highly skilled with weapons and their fists, and thr brothers proved particularly useful when fighting the Doliones. Zetes and Calais – The brothers Zetes and Calais were collectively known as the Boreads, being the sons of Boreas, the god of the north wind, and Oreithyia. Zetes and Calais had the ability to fly, a useful skill made use of to chase away the Harpies during the Argonaut’s quest, for the Harpies were tormenting Phineas. Meleager – Meleager was a prince of Calydon, born to King Oeneus and Althaea. Although not amongst the most prominent of the Argonauts, Meleager’s fame would come later when he would lead the Calydonian Hunters in his homeland. Orpheus – Orpheus was the son of Oeager and Calliope, and was a hero and a noted musician. Orpheus’ music would allow the Argo to pass the island of the Sirens virtually unharmed, and would also had resolve to the other heroes in times of danger. After the quest of the Golden Fleece, Orpheus is most known for his descent into the Underworld to retrieve his wife, Eurydice. Peleus – Peleus was the son of Aeacus and Endeis, and also famously the father of Achilles by the Nereid Thetis. In his life Peleus had many adventures, but whilst on board the Argo, Peleus was noted because he was used as a messenger between the goddess Hera and the other Argonauts. Telamon – Telamon was another son of Aeacus and Endeis, who also had famous children in the form of Ajax the Great and Teucer. Telamon also had his own adventures and was an occasional companion of Heracles, but during the journey to and from Colchis, Telamon acted as the prominent critic of Jason’s leadership. Acastus – the son of Pelias and Anaxibia, who was forced to join the Argonauts to prevent his father deliberately sabotaging the voyage. Argus – the son of Phrixus and Chalciope, and builder of the Argo. Asterius – the son of Cometes from Piresia in Thessaly. Butes – the son of Teleon and Zeuxippe from Attica. Butes was rescued from drowning by Aphrodite during the quest, and became the lover of the goddess. Cepheus – King of Arcadia, son of Aleus, and friend of Heracles, who would die fighting alongside the hero after the quest of the Argonauts had finished. Erginus – son of Poseidon or Periclymenus. Euphemus – son of Poseidon from Psamathus. Eurytus – son of Hermes and Antianira. Hylas – the son of Theiodamas and Menodice, prince of the Dryopes, and companion of Heracles. Hylas was abducted by nymphs on Mysia and Heracles and Polyphemus remained behind to search for him. Iphiclus –the son of Phylacus and Clymene, swift of foot. Iphitus – the son of Naubolos, hero from Phocis. Menoetius – son of Actor and Aegina, friend of Peleus and father of Patroclus. Pericylmenus – the son of Neleus and Chlrois, hero with the ability to shapeshift. Polyphemus – the son of Elatus and Hippea, companion of Heracles and Hylas, left behind upon Mysia. Tiphys – the son of Phorbas and Hyrmina, and pilot of the Argo before his demise on the voyage. Other prominent individuals mentioned by one or more sources also included Admetus, King of Pherae, Deucalion, prince of Crete, Eurytion, King of Phthia and father-in-law of Peleus, Iolaus, nephew and charioteer of Heracles, Nauplius, a hero blessed with long life, Nestor, another long lived hero, Oileus, father of Ajax the Lesser, and Poeas, father of Philoctetes. Some names mentioned in later versions of the myth though make little sense and cannot be reconciled with other Greek myths; with names including, Asclepius, the demi-god and noted healer, Laertes, the father of Odysseus, Philoctetes, the Achaean archer from the Trojan War, and Theseus, the slayer of the Minotaur. The addition of fanciful names is most likely a case of embellishing the story to make the quest even more heroic than it was, but in the case of Theseus the story makes no sense, for it was said that Theseus and Patroclus were imprisoned in Hades at the time, and the timeline of Theseus has the hero meeting Medea for the first time after the voyage of the Argo. 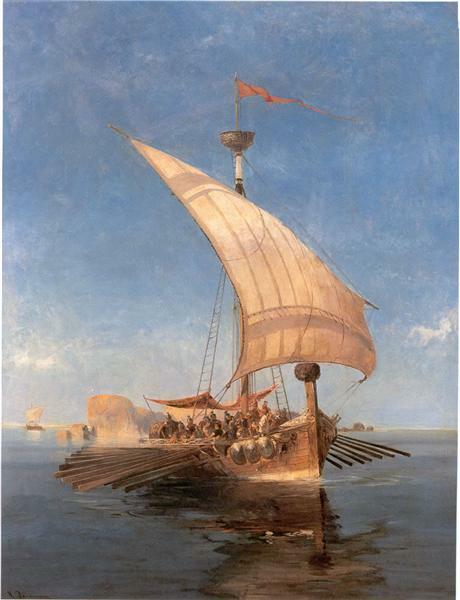 The composition of the crew of the Argo though was not static in any case, for the crew that left Iolcus was not totally the same as the one that returned with the Golden Fleece. As already mentioned, Heracles, Hylas and Polyphemus were left behind upon Mysia; and Butes was saved from drowning at the island of the Sirens by Aphrodite. The quest undertaken by the Argonauts was also a dangerous one, and some were killed during the voyage to and from Colchis; with Idmon killed by a wild boar, Mopsus died from an encounter with a poisonous serpent, and Tiphys succumbed to a mysterious illness. 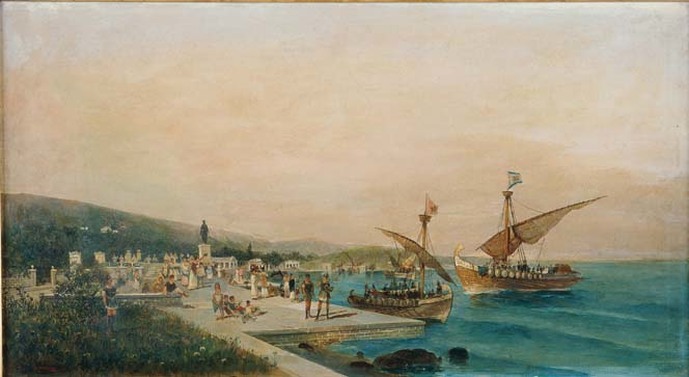 At other times the number of Argonauts were also bolstered, and the four sons of Phrixus and Chalcioppe, (Argus, Cytisorus, Melas and Phrontis) would join the crew. Likewise, on the return journey, Medea the daughter of King Aeetes, also came with the Golden Fleece, having fallen in love with Jason.